In present times, where technology seems to have the ability to deliver and offer everything a man can wish for, computers and gadgets can be found everywhere. Especially computers, from offices, cafes, malls, these peripheral devices can be found even at your home. But what do you exactly do when your computer become obsolete, outdated, or all of a sudden, broke down. • iMac Aquarium – is computer-aquarium made by detaching the electrical component inside an iMac monitor including the cathode-ray tube and replacing it with a custom-made aquarium. The idea came from a professional photographer named Jake Harms from Nebraska, United States. He admitted that it took him a great deal of time to create a perfect curved shape similar to the iMac’s cathode ray tube. 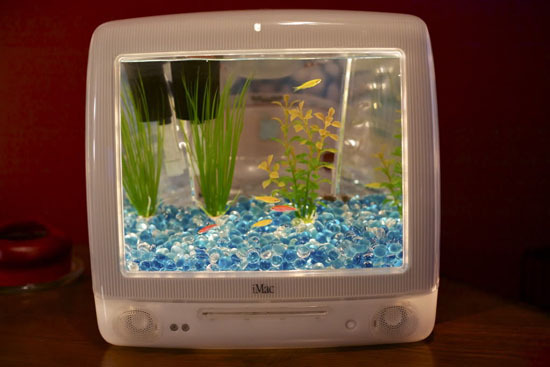 Presently, he sells iMac Aquarium online for $250 each, available in colors red, blue, aqua and white. • Crunching G4 Table – is a geeky-chic table made of two iMac G4 CPUs. Mike Elgan of Houzz.com, described the Crunching G4 Table as, “a coffee table made with Macintosh G4s. The machine itself is obsolete. But the product is too beautiful to destroy or discard. Repurposing it into furniture lets us remember it.” It is available for the price of $600 at Reform-Designs.com. • Apple G4 Desk Lamp – also known as the iMac desk lamp. This lamp can add a techie-vibe in your room or office desk. Made from the iMac G4’s monitor stand and by employing a bulb and an arm connected to it, Nicholas, created the iMac G4 Desk Lamp out of his obsolete Apple computer. It beholds a semi-spherical shape and the Apple’s logo on it. I would consider it as a great gift for Apple fans. Isn’t it nice to know that even though technology seems to be conquering all the industry fields, some doesn’t forget the welfare of our environment? It isn’t a small deal on how they put some effort and time in re-creating these obsolete gadgets so they wouldn’t end up in our landfills, polluting our land. Erika Celario is an environmental blogger from Tonergreen.com, an online marketing firm that aims to be the leader in providing environmentally responsible printing solutions such as remanufactured toner cartridges like Xerox toner cartridges and Lexmark toner cartridges. What Can I Grow in My Hydroponic Garden?